cv. of amoena x vittata, Van Geert. 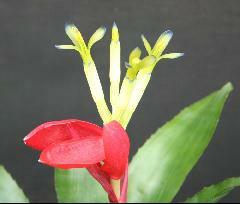 Since the early 1970's I have been trying to get a good photo of a plant called Billbergia 'Collevii'. My plant never flowered and yet for 30 years I was hearing reports of flowering but alas no photos for me to examine. It was in the 1980's that I started to look closely at Billbergia 'Chas Webb' which had been guessed as a (amoena x vittata) hybrid, and what were the real differences between it and Billbergia 'Breauteana' a hybrid made in 1884 in France. 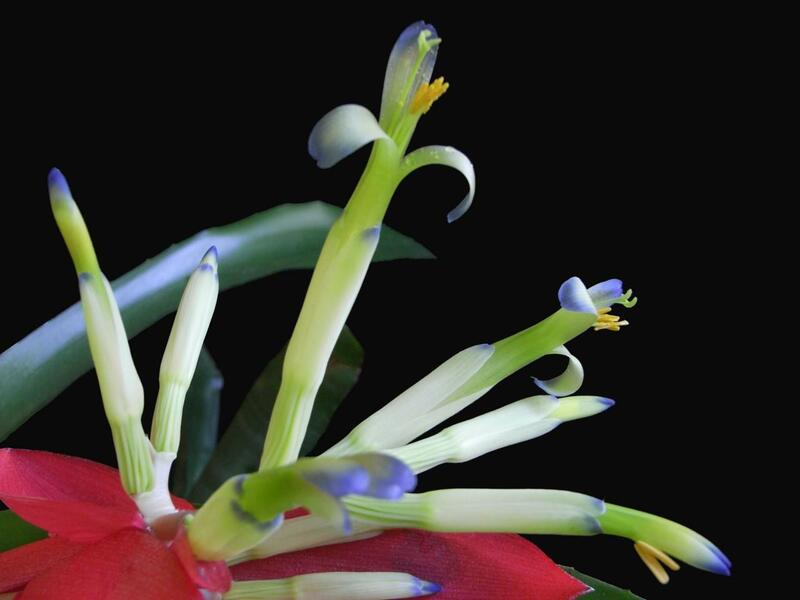 The parents of Billbergia 'Breauteana' are quoted as (pallescens x vittata) and we know that Billbergia pallescens became Billbergia amoena. I could find no differences and convinced myself at least, that Billbergia 'Breauteana' had got to Australia as an unknown, early in the 1900's. In my investigations into this saga I bumped into Billbergia 'Collevii' which was a hybrid (amoena x leopoldi) done in the late 1800's using the same parentage when we realise that Billbergia leopoldi is now Billbergia vittata! If we follow Chevalier - See Bromeliad Cultivar register - the plants look similar and have blue petals. 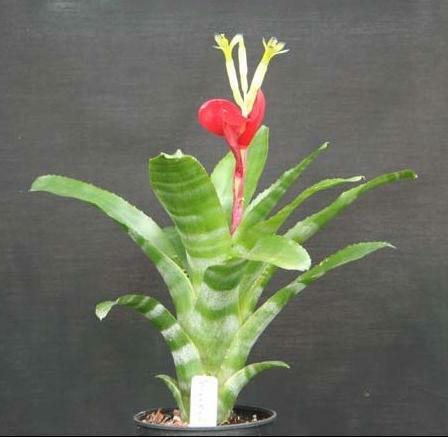 In 2000 I got a photo from Ruby Ryde which really had me wondering because here was a plant with clear traits of a Billbergia amoena - which is one of the parents of Billbergia 'Collevii'. This feeling was confirmed recently when I got a photo from George Rudolph - see attached - and I decided something must be reported. I have never seen self set seed on my various Billbergia Chas Webb' and wonder if it ever does because to my mind what we are growing as Billbergia 'Collevii' is really 'Collevii' F2. I will be making a note in the Cultivar register but making no attempt to give a new name to it as I usually suggest. The name 'Collevii' has been too long associated with the amoena looking plant for it to be willingly altered to a new name by ALL who have the plant. Just remember the problem if you try to identify a hybrid from the parents listed! Posture slender, leaves gracefully reflexed, of a beautiful green, large areas of white, flowers blue, bracts rose carmine. Note: Hybrid between B. amoena (fem) and B. leopoldi (male) similar to that of B. Joliboisi and B. Rhedonensis. Posture stocky, leaves dark green, dusted with fine powder, marked with alternate areas of crimson-violet and bands of white, spines black, flowers blue, bracts carmine. Posture slender, leaves clear green with strong dusting of fine powder, narrow areas of white, spines short, Flowers blue, bracts clear carmine. This is prompted by the photos we now have of this hybrid as grown by Don Beadle in Florida, USA. 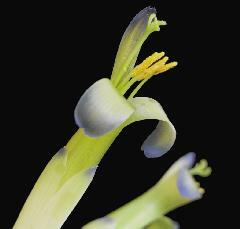 Billbergia vittata x pallescens (note that the pollen parent is now treated as B.amoena) = B. Breauteana Andre in Rev. Hortic. LVI (1884) 117. B. vittata x amoena = B. Wittmackiana Witte in Gartenfl. XL. (1891) 328 et XLIII. (1894) 393, t. 1405. = B. Cappei Morr. ex Bak. Bromel. (1889) 83. 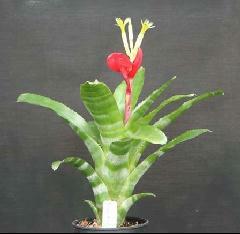 = B. zebrina Cappeana Carr. in Rev. Hortic. L. (1878) 116 (false e B. Leopoldi orta ibi dicta). = B. Joliboisii Van Geert ex Belg. Hortic. XXXII. (1882) 334 (false e B. Leopoldi orta dicta). = B. Collevii Van Geert, l.c. = B. rhedonensis Van Geert, l.c. = B. Oberthueri Van Geert, l. c.
= B. Herbaulti Hort. ex Bak. Bromel. (1889) 83. From this we can see that Mez was of the opinion that the B. leopoldii was in fact B. vittata which brings us to a plant that should flower like B. ‘Breauteana’ (Or the Australian ‘Chas Webb’) with its blue petals and yet the Australian B. collevii has petals like a B. amoena – pale green with blue tips. The Australia plant is close to B. amoena in the shape of the inflorescence and petal colour whereas the plant that Don Beadle grew in Florida had petals like B. amoena but an inflorescence with influences of B. vittata. The next question to ask is how did B. ‘Collevii’ get to the USA. Very few European hybrids were mentioned by either Nehrling or Mead when they were at their peak in the 1920’s to 1930’s, with species being grown. The only known hybrid was B. ‘Bruantii’ which had been obtained from the New York Botanic Garden. Mead was the very keen hybridist and in fact crossed B. pallescens (now B. amoena) with B. leopoldii. And would have called it B. pal-leo in Mead’s own shorthand. Mead died in 1936. In the 1940’s we know that Mulford Foster had Mead’s stud-book and there is a possibility that Foster could have worked out that this was the ‘old’ B. Collevii. and named it accordingly. Whereas Julian Nally who had many of the plants, may not have been aware of this change. Isn’t it a pity we do not have an inventory of the plants that Julian Nally started off with. It does not surprise me that anyone growing seed from B. Collevii would have assumed that the seedlings were also B. Collevii. BUT we know that B. ‘Collevii’ is a primary hybrid and you get a mixed bag from the next generation with some looking like B. amoena and some like B. vittata and some in between. I would suspect that Mead’s original crossing has died out in the course of time – but who knows? I cannot see any advantage in trying to get the owners of B. ‘Collevii’ to change their labels to a new name, so the imposter stays. The keen ones will note the situation by reading the detail on the BCR. George Rudolph, 2005 Ian Hook 06/08, from Ruby Ryde.